I’ll admit to not knowing if the wedding blog world is all atwitter with news of the royal wedding…I just assume it is. In all honesty, I stopped looking at wedding planning blogs after our big day. More power to you if you’re one of those ladies who decided to create a business around the wedding industry…I was over it by the time our day came and went. I can’t imagine the singular obsession over small details that is about to take place…it will be surreal, for sure! There’s actually a William & Kate wedding tracking website…that was started back in 2008! Omg, what did those people talk about for two years?! So you can only imagine how it will be now that there’s an actual wedding to talk about!! Your future hubbie’s parents had the wedding of all wedding that captivated the whole world! Every detail will be scrutinized…from the food choices to the colors to the favors. People will look to every thing you do…many of the things you do will be mimicked by brides across the globe. There’s probably so much more. But ladies, think back to your planning. About all the snide comments that you had to shake off, the worries you had about your weight, your makeup, all of it. I know we all want to say how awful the WIC is for making us feel crappy about the way we look and the things we do…but in this case, how could she not feel pressure?! What a weight to carry! So what would you do? Would you even have said yes to the prince? How would you handle the expectations of an entire country and the interest of the entire world? How would you stay sane in this situation? My work life is about to really get fired up here pretty soon. Between that and starting a work blog about coaching female athletes and team building, I’m crazy busy…and oh yeah, I just got married and would like to have time to spend with my new husband. So I’ve given myself a post schedule in order to not drive myself (and others!) crazy. From now on, I’ll post new content on Tuesdays, Thursdays, & Saturday and/or Sunday. That was just an informational sidenote for y’all. I’ve been wanting to talk to you all about some of my favorite wedding posts for a while and have finally compiled my list…so here we go. Happy clicking! Black brides: Dirty Little Secret was about the absent women of color in the cool (non WIC) blogs & the first Tale of the Tape about the lack of women of color in bridal magazines. Marriage: Both of these were written well before we got married and I still like them. Check out John Lennon was about imagining a different way to be married and Dear Married People about honesty in talking about the institution. Wedding Industrial Complex (WIC): Sanity was about my conspiracy theory that the wedding vendors and bridal magazines are in cahoots, and I Think I’ve Figured It Out talked about not getting caught up in the pretty pictures and feeling badly about your wedding. My dad: As you guys know, my dad passed away in 2008…about a month after I met The Mister so they never met. Here’s a post I wrote before the wedding, Dads, and one I wrote afterwards…on Father’s Day, Daddy’s Girl. Haters: Every bride planning a wedding has the nay-sayers. I didn’t talk about them a lot, but Things was dedicated to them. Looking back, I’m happy I did this stuff: Custom stamps! People loved them, I loved them, and I wrote about them here and here. Honoring my father during the ceremony…Giving Honor talked about that. My ceremony reading was a Nikki Giovanni poem called Resignation, which talks about being an independent woman who falls (completely and totally) for her man and realizes what it’s like to put someone else’s needs ahead of her own. DIY: I’m not crafty or do-it-your-selfy, but we did do a couple of things that turned out pretty well…and saved a ton of loot. I made eight cake stands for less than $20 using stuff from the dollar store. Have you priced out cake stands lately…they’re crazy expensive! We did our own invitations (STD’s, invites, reply cards, inserts, envelopes, ceremony programs…everything) and they were pretty awesome, in my opinion. Finally, my bridesmaids did all of the flowers for the ceremony and reception…and they were gorgeous! I estimate that we saved about $2500 just by doing these things. Things I fretted over that I shouldn’t have: Having cocktail napkins with our names and wedding dates on them…I still have a whole mess of those things left! *shaking head* Though the ribbon that’s on this same post, Weddingy, was pretty awesome. We used it to hang our pew balls (flowers) and on our reception favors. And here I openly acknowledge my worry as pointless…but continue to worry, lol! Week of: My favorite post from our wedding week. Mostly because I was dizzy with pure, 100% fortified tired. It’s when I acknowledged that I was a little batty…Weddingese was posted the Sunday before our Friday wedding. Wedding picture: This one isn’t even from our photographer, but one of my bridesmaids. It’s our first dance and shows how happy I was to marry The Mister. I just couldn’t (or wouldn’t) stop looking at him. After the wedding: I took two cell phone pictures of The Mister and I’s stuff together and I like looking at them both. The first was our rings sitting together and the other is my wedding dress and his wedding suit hanging together on the same hanger…very powerful images. 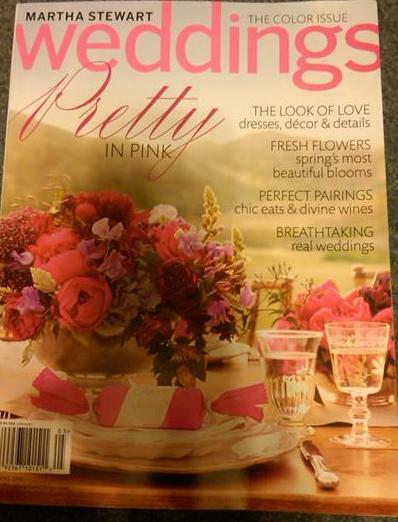 So, I bought another wedding magazine. Even though our wedding is less than two weeks away. And I certainly have no real need to be looking at magazines…except I just really like them. Anyhoo, normally in my tale of the tapes, I count up how many White brides and brides of color are in the magazine and then report back to you guys. Well, I didn’t have to count. There were two brides of color and hundreds (literally) of White brides. You can go and check out her website if you’d like. No women of color. But she’s a woman of color. Hmmm. I’m sure it has to be hard being a woman of color in an industry that doesn’t celebrate diversity. I would think that she’s made a concerted effort to be like everyone else, to be colorless in the presentation of her product. 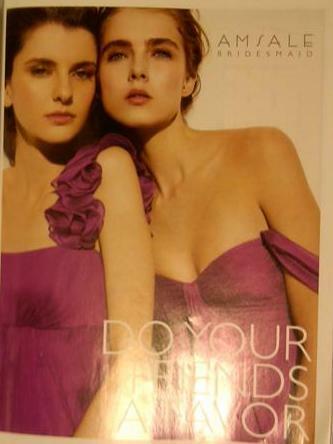 But I’d also think that she’d take an all inclusive approach to advertising. Why not Hispanic, Asian, Black, and White models? I’m not saying she’s gotta be all power to the people. But who’s gonna be the one to step out on a limb? So I don’t have cable. 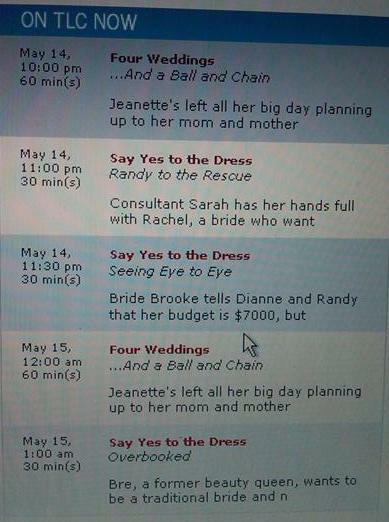 So I don’t get to watch these shows most times…except when I stay in a hotel. Which I am now. I’m amazed at these shows (not that I’m gonna stop watching!) and the extravagance, the crazy expectations, the stupefying budgets. I’m not going to get on my soapbox here, but I wonder how much these bridal shops are slipping TLC to get brides and brides-to-be thinking that a “cheap” dress costs $3,000? And how much are the designers slipping the bridal shops to be featured on television? Just wondering. …that when you Google “bride photo”, no women of color will come up? …that it’s the same when you switch out “bride” with “groom”? …that “wedding hair” turns up lots and lots of ugly hairdos…but none on women of color? …that the only way to get a woman of color in any sort of wedding-y or bride-y photo is to actually input “woman of color”? 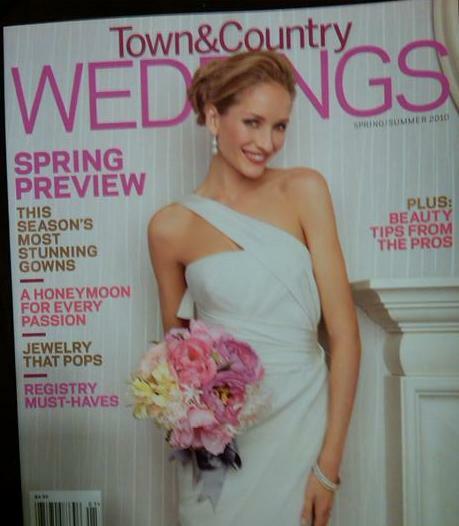 …that women of color apparently don’t have flower girls? …that no brides of color have mothers? It seems that the assumption is that every bride is White…or perhaps it’s like a default setting or something. I’ve been told a few times to go and check out the blogs devoted solely to brides of color…and I do, but I just don’t understand why the segregation within the wedding industry is accepted as part of the deal. Yes, it’s great that I can go to specific sites and see a whole mess of weddings of color…but why can’t I go to one mainstream site and see White brides, Hispanic brides, African American brides, Asian brides? You get the picture. It’s like the industry is stuck in the ’50s and ’60s…a water fountain for us and one for them. The numbers are still crazy…and unfortunately, still not surprising. 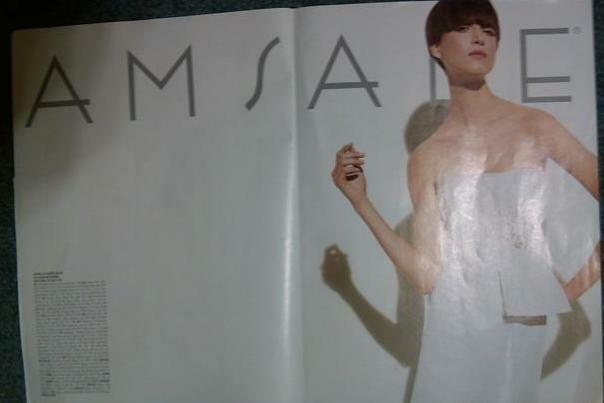 Even designers of color (Mark Ingram, Vera Wang) choose not to use women of color in their ads. Why is that? Do they think that their product becomes less marketable? Less desirable? Less relate-able? We’re often told that we’re supposed to be obsessive crazy ladies once our guys ask us to marry them. So I had planned on being said crazy bride lady…but then it didn’t happen. Then the conspiracy theorist in my started wondering whether or not all of the “musts” of wedding planning were contrived in some sort of joint deal between people who sell wedding stuff and the people who sell ads to people who sell wedding stuff. You follow? Go check this post out as I wind my way through the wedding industry and why it is as it is.